DATES: Simon Peter was born 26 January 1821 in Jackson Twp. Wayne Co. OH. He is the son of Jacob Shinabarger. He died on the 16 January 1902 in LaPorte Co. IN. He is buried in the Westville Cemetery in Westville, IN. MARRIAGES: Ester Tabor on 30 October 1844. 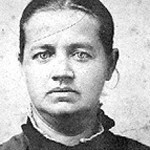 Ester was the daughter of Jonathan and Laura Bell Tabor. 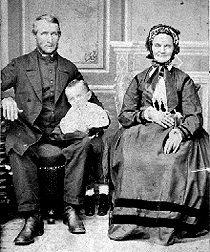 Esther was born 13 August 1829 in Erie Co. PA. and died 17 April 1849. 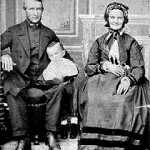 Simon married Ester’s younger sister Laura A. Tabor on 1 June 1852 in Berrien Co. MI. Laura was born 12 November 1836 in Erie Co. PA. She died 24 April 1917 and is buried alongside Simon Peter at Westville Cemetery. 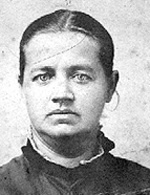 Hannah “Helen” Shinabarger – born 31 January 1847. Burton (Burt) Judson Shinabarger – born 1849. Martha E. Shinabarger – born 8 January 1856. Alta Zana Almeta Shinabarger – born 25 July 1859. Ernest Franklin Shinabarger – born 7 September 1860. Lillian (Laura) Belle Shinabarger – born 9 January 1863. Nellie L. Shinabarger – born 22 September 1865. Edward Sylvester Shinabarger – born 23 February 1868. Mary Celina Shinabarger – born 5 February 1870. Walter Orville Shinabarger – born 31 October 1874. Maude Vivian Shinabarger – born 25 August 1878. DO YOU RECOGNIZE THESE PEOPLE? The photo was taken by John Koella, a Swiss photographer, who immigrated to the US in 1872. It is marked Deutsche Photo, Toledo OH. The woman is believed to be Hannah Heller Shinabarger Tabor with her son, Simon Peter. The boy could be Edward or Walter. Any ideas? Thanks for history. I have tried for some time to learn more about Koella because of this photo. The photo is stamped as Toledo and I question who the people are, certainly relatives, but just not sure if they were in Toledo or if the photo was taken by somewhere else. Maybe John had shops elsewhere? I will send along the photos and document I wrote up when I researched him. Thanks for contacting me. My great great grandfather was also John Koella. This photograph was taken by my Great Great Grandfather, My Great Grandfather. Frederick Koella was also a noted photographer in Toledo. I would love to have a copy of this image, front and back! What a treasure, our family continues to have photographers, seems to run deep in our blood line. I have an awesome photo of John Koella with my Grandmother as a child, and her mother, Bertha, Fredericks wife. What a legacy! Thanks. Wish I could help. Many relations had the middle initial of “E” but short of guessing, I have not seen any reference for its meaning. Daughters Edith and Luella also had “E” for an initial, so I would rule out Edith as a middle name. A common name in the earlier family was Esther (Martha’s paternal great grandmother and of course her father’s first wife and sister of her mother was an Esther. That would be my guess.) If you have any info to add on the parents of Charles Wilson Pettit, I would love to have it. Plus any corrections about Martha. I have a lot of info on the Shinabarger/Pettit families through the 1990s from my mom, Vera Shinabarger Bunyard. Seems to me I have seen correspondence between the two of you. Glad to share whatever you would like. Think I have pictures around here too but would have to dig around. I am Simon Pettit’s daughter and Laura and Simon were his grandparents. Martha Shinabarger was my grandmother. All these years we have wondered what her middle name was. Martha E. Shinabarger. Could you give us the answer we have always wondered about? These are my great great great grandparents and I was surprised to see their pictures on google. Thanks for posting them on here or I would have never known what they looked like. I am the great great grandson of Mary Celina Shinabarger.